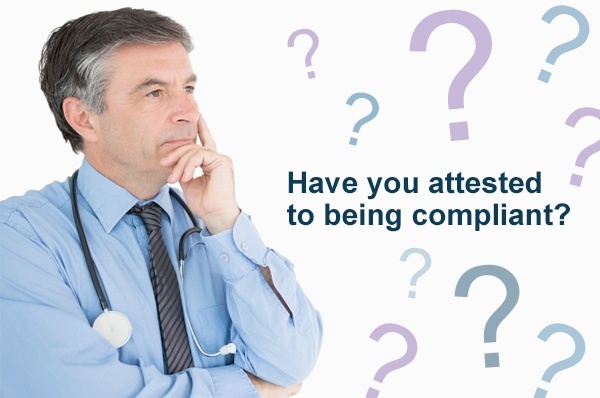 OIG Exclusion Checks: Have You Attested to Being Compliant? The “Special Advisory Bulletin on the Effect of Exclusion from Participation in Federal Health Care Programs” issued by the Office of Inspector General (OIG) in May 2013 concretized the need for healthcare providers receiving Federal and State funds to perform monthly Federal Government exclusion database checks on individuals/parties with whom they do business or who they employee. Since that time, Federal payers have increasingly started including language in their provider contracts and compliance program guides, requiring compliance with OIG Exclusions. Providers receiving Medicare and Medicaid reimbursement typically as part of a new contract enrollment or re-enrollment are being asked to attest to the specific compliance program guidelines. Are you in compliance with the monthly exclusion check requirement or are you attesting without conducting the exclusion checks? Attesting compliance while being non-compliant is a potential and enormous regulatory risk which could lead to huge fines, penalties, and could even constitute fraud. Congress, in 1977, mandated the exclusion of physicians and other practitioners convicted of program-related crimes from participating in Medicare and Medicaid. This was through the Medicare-Medicaid Anti-Fraud and Abuse Amendments, Public Law 95-142. The Civil Monetary Penalties Law (CMPL), Public Law 97-35 of 1981 further addressed fraud and abuse by stating person’s submitting claims who were excluded violate the CMPL. In 1996, the Health Insurance Portability and Accountability Act (HIPAA) expanded the OIG’s sanction authorities to expand to all “Federal Health Plans.” The OIG’s authority has continued to increase through the 2003 Medicare Prescription Drug, Improvement and Modernization Act and the 2010 Patient Protection and Affordable Care Act (ACA). In order to assist providers in tracking excluded individuals, the OIG provides updates to the List of Excluded Individuals and Entities (LEIE) and the General Services Administration’s (GSA) System for Award Management (SAM) on a monthly basis. Having recently read the Compliance Program Guidelines for Aetna’s Medicare plans, it is clear Aetna is expecting providers to support their compliance program through routine auditing and monitoring of certain risks. Non-compliant providers can be placed in a corrective action plan (CAP), undergo retraining and/or result in termination of the provider contract and relationship with Aetna. Maintain record of your compliance program and training for no less than 10 years. What is Aetna’s Compliance Expectation for OIG and SAM Exclusion Monitoring? Aetna requires exclusion checks to be conducted pre-employment or contract and monthly thereafter. This includes new employees, temporary employees, volunteers, consultants and governing body members. The LEIE and SAM exclusion systems are to be checked with the provider maintaining record of these checks for the minimum of 10 years. Please keep in mind these are Aetna specific requirements, knowing most Managed Care Organizations follow similar specific requirements. How Can LW Consulting, Inc. (LWCI) Assist Your Practice? LWCI has a cost-effective way for you to comply, which does not pull your resources to conduct the auditing and monitoring. You can outsource the function of identifying excluded and sanctioned providers to LWCI or utilize our software service to efficiently check the exclusions. LWCI’s services include the OIG LEIE, GSA EPLS/SAM and State exclusion monitoring options. If you are interested in hearing more about the LWCI OIG Exclusion service and how outsourcing these exclusions reduces your compliance risks, please do not hesitate to contact Jennifer Matoushek, Senior Consultant at 717-213-3130 or email JMatoushek@LW-Consult.com. LWCI is ready to assist you with maintaining compliance with exclusions in support of your provider contract, as well as assisting you in responding if you should identify an excluded individual. Also, if you have additional compliance and auditing questions, please contact Deborah Alexander, Director of Rehabilitation Consulting at 215-907-8740 or email DAlexander@LW-Consult.com. Looking for more resources? Click below to download our OIG Exclusions and Sanctions whitepaper.